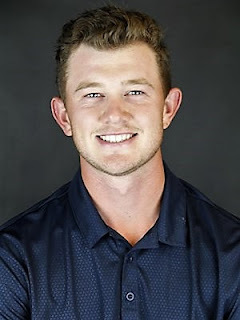 Ben Hallam from Cheshire, a third-year student at California Baptist University, finished joint ninth position in a field of 80 competitors at the Fujikura Invitational college 54-hole tournament at Shadowridge Country Club, California. Ben, pictured, who stands 6ft 2in, had rounds of 75, 78 and 68 for a total of 221. His 68 was the lowest score by anyone in the third round. Elis Suard (Monterey Bay) won by one shot with scores of 68, 70 and 71 for seven-under 209.